The "postpile" is a fascinating geologic formation. The process of its creation began almost 100,000 years ago, when molten basalt lava flowed from the earth one mile upstream from the modern-day monument. Imagine a mass of lava 400 feet deep flowing like a river for three miles. As the lava slowly cooled from the outside toward the middle of the flow, ideal conditions caused the lava to crack into long post-like columns. During the last major ice age, which ended about 10,000 years ago, a glacier sculpted away the top layers of lava. It revealed the internal fractured lava mass and exposed a wall of columns 40 to 60 feet high. Some say it resembles a giant pipe organ. The 140,000 visitors per year each find their own metaphor to describe it, but all of them call it "fascinating!" Many fallen columns now lie fragmented on the talus slope below. A hike to the top of the Postpile reveals not only a cross section of the posts, but the most interesting effect of the ice - polished tops on the basalt columns. Here, the column ends are exposed like a tiled floor and exhibit parallel striations where the glacier dragged rocks across them. Basalt columns formed 100,000 years ago from a cooling lava flow have drawn visitors to the Devils Postpile National Monument, once a part of Yosemite National Park. A remarkable sight, these columns range from four to seven sides in various sizes. Two miles downstream from Devils Postpile is Rainbow Falls, a 101-foot drop in the lava formation, which sends rainbows of color into its mist. High on the western slope of the Sierra Crest, nature reveals two of its wonders - the weirdly wonderful "postpile" and the lovely San Joaquin River with its dramatic Rainbow Falls. 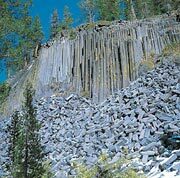 The geologic formation that is "the Postpile" is the world's finest example of unusual columnar basalt. Its columns of lava, with their four to seven sides, display a honeycomb pattern of order and harmony. Another jewel in the Monument is the San Joaquin River. Along the river corridor, the Monument flourishes with life. Meadows burst forth with flowers that nourish deer, birds, and butterflies. This portion of the San Joaquin is a designated Wild Trout River where both novice and expert can play the waters for four species of trout. Lining the river is a combination of old-growth red-fir forest and new growth rejuvenated by fire. On the lower reaches of the Monument's 2.5 miles of river course, rainbows frequently sparkle over their namesake -- the 101-foot drop of Rainbow Falls. is located downstream from the Devil's Postpile. The San Joaquin River flows over an abrupt 101-foot drop, sending rainbows of color into the midst. Truly a sight that is breathtaking and worth the easy 2-mile walk.In addition to its geologic wonders and the beauty and diversity of the San Joaquin River, the monument is a portal to the great Sierra backcountry. Some 75% of the monument is part of the Ansel Adams Wilderness. It is traversed by the historic John Muir and Pacific Crest trails; you can follow a trail from here to Mexico or Canada! Summer season only: Opens in late June to early July, weather permitting. Closure in the fall depends on weather. Ranger Station open July - August 7 am - 6 pm (closes for emergencies). From late June to early September, day-use visitors to the Devils Postpile/Reds Meadow area must ride the shuttle bus -- see "Getting around" below. The road is closed from 7:30 am & 5:30 pm daily. All day-use visitors must ride a shuttle bus from Mammoth Mountain Ski Area between those hours. The first shuttle leaves at 8 am; schedules are posted there. Exceptions to shuttle use: walkers, bicyclists, vehicles carrying 11 or more passengers, vehicles carrying non-ambulatory passengers, people with valid camping permits, overnight guests at Reds Meadow resort or pack station, & vehicles pulling horse trailers or boats. Backpackers: wilderness permits do not include permission to drive to the trailheads or to the valley; you must use the shuttle or walk. Shuttles have racks, which accommodate backpacks. This shuttle system is necessary to lessen impacts on the environment & the visitor. Please relax & enjoy the view on your ride. Accessibility is very limited in this remote area; none of the facilities or trails meets the ADA.